Another blast from the past, way back when I was a teenager. Having my eye on this place for a long time and seamingly not possible, the oportunity finally appeared and I couldn’t miss the chance. It’s been a while again for various reasons but my mind has not been off the urbex game at all. So coming back at you with a first, meet what I shal name “The Art Deco”. 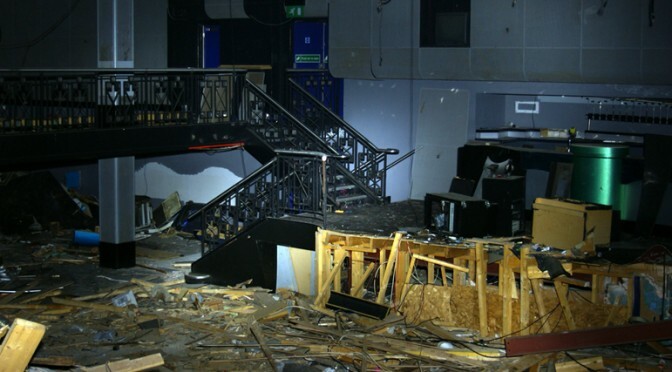 After exploring another nightclub in recent months gone by, it suddenly dawned on me that this place has been standing empty for quite some time now and being close by would be well worth a mooch about. Without even realizing this place had shut down in 2012 and with the odd few hazy memories from back in my college days, I woke up to a tip off that this place was now accessible. Gathering every detail I could and messaging the usual local explorers, myself and Tiny Urban Exploration were at the site the very same day.